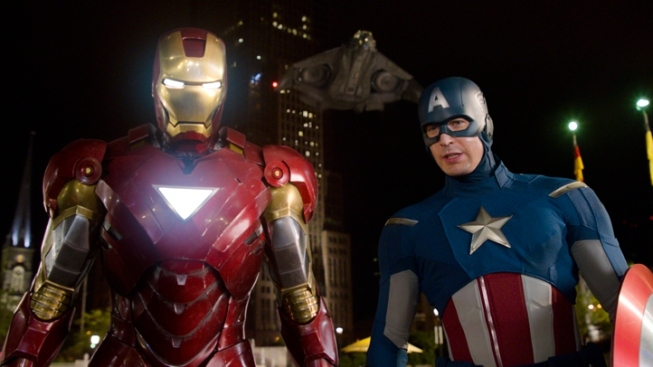 Iron Man, portrayed by Robert Downey Jr., left, and Captain America, portrayed by Chris Evans, join forces in "The Avengers." 1. "Think Like a Man," $18 million. 2. "The Pirates! Band of Misfits," $11.4 million ($5.5 million international). 3. "The Lucky One," $11.3 million ($4.8 million international). 4. "The Hunger Games," $11.25 million ($7.4 million international). 5. "The Five-Year Engagement," $11.2 million. 6. "Safe," $7.7 million ($2.4 million international). 7. "The Raven," $7.3 million. 9. "The Three Stooges," $5.4 million. 10. "The Cabin in the Woods," $4.5 million ($1.5 million international). 1. "The Avengers," $178.4 million. 3. "Titanic" in 3-D, $18.5 million. 4. "American Reunion," $14.5 million. 5. "The Hunger Games," $7.4 million. 6. "The Pirates! Band of Misfits," $5.5 million. 7. "The Lucky One," $4.8 million. 8. "Le Prenom," $4.4 million. 9 (tie). "Mirror Mirror," $3.2 million. 9 (tie). "Wrath of the Titans," $3.2 million.